You know that Barbie is a real fashionista and shopaholic. Today, she decided to choose a dress with polka dots. Do not limit your imagination and help Barbie as soon as possible. Good luck to you! Well, you must surely know that polka dots are trendy again! And of course, Barbie surely knows it, because she's a true fashionista, not to mention that she is also a shopaholic well, that is why you must help her at any rate! 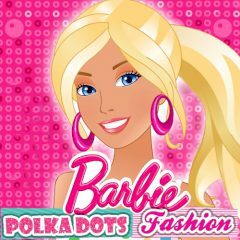 As you can probably guess, Barbie's wardrobe is filled with polka dots themed clothing items. Well, do you want to check them out? Then first choose your style, glam or casual, fancy or classic, rock or funk and just go ahead! Have no doubt that you can cope with it and help Barbie as soon as possible.